To describe the vascular characteristics of the choriocapillaris layer in acute central serous chorioretinopathy (CSC) imaged by optical coherence tomography angiography (OCTA), and to analyze the vascular density. Retrospective, observational case series. In the study, 20 eyes of patients with acute CSC and 20 normal individuals were selected. All underwent OCTA, and 3 mm × 3 mm scanning mode was chosen for analyzing vascular density and morphological characteristics on the choriocapillaris layer. A dark region with some hyperreflective signal spots on the choriocapillaris layer was found in all affected eyes' OCTA images. The choroidal vascular density (CVD) in the affected eyes was significantly lower than in the normal eyes (P = .000 vs. P < .05). Additionally, the density of affected eyes was much smaller in comparison with the fellow eyes, which was statistically significant (P = .000 vs. P < .05). Fellow eyes' density was also lower than in normal eyes (P = .009 vs. P < .05). OCTA could offer a new approach to help understand the mechanisms of changes in the choriocapillary with imaging and provide quantitative analysis, as well. Tools such as fluorescein fundus angiography (FFA) and indocyanine green angiography (ICGA) were usually applied to elucidate underlying mechanisms of the disease; however, the intravenous injections of dye, which would be required in both imaging techniques, could cause serious side effects.7 On the other hand, optical coherence tomography angiography (OCTA) could provide objective statistic data, and it appeared to be a promising imaging method because the method is more convenient and does not involve in any issues with side effects . The aim of this study is to describe the vascular characteristics of the choriocapillaris in acute CSC imaged by OCTA and to analyze the result of choroidal vascular density. Twenty healthy volunteers and 20 eyes of patients with acute CSC from Peking Union Medical College Hospital were included from March 1, 2016, until April 30, 2016. Patients underwent ocular examinations such as best-corrected visual acuity testing, dilated fundus examination with slit-lamp biomicroscopy, and OCT and OCTA at baseline. Only 10 patients underwent FFA and three patients underwent ICGA in this study. The signs of CSC include painless loss of central visual acuity and serous macular detachment visualized by spectral-domain OCT (SD-OCT). Among the 20 patients with clinical history of CSC for less than 6 months (range: 2 days to 5 months) were those recently diagnosed with CSC as well as treatment-naïve patients. In addition, patients with CSC who had any associated or concomitant ophthalmological conditions were excluded from the clinical study because the accompanied conditions (ie, subretinal fibrosis, age-related macular degeneration, macular or retinal vascular diseases, vitreoretinal diseases, retinal surgeries, uveitis, glaucoma, and hereditary retinal dystrophy) could complicate the interpretation of the imaging results for patients with CSC. OCTA images were acquired using the RTVue XR Avanti with AngioVue (Optovue, Fremont, CA), which uses an algorithm software called split-spectrum amplitude decorrelation angiography (SSADA). The software enables the generation of three-dimensional en face angiograms through the decorrelation of two merged, consecutive orthogonal registration volumes that are centered at the macula. Furthermore, segmentation at the superficial retinal capillary plexus, deep retinal capillary plexus, outer retina, and choriocapillaris were automatically generated. The choriocapillaris consists of capillaries in a 30-μm-thick layer that is posterior to the retinal pigment epithelium-Bruch's membrane junction. 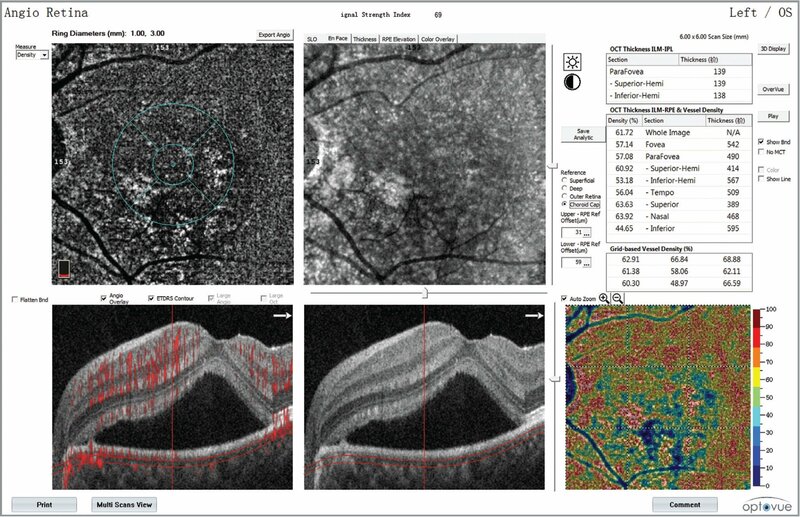 The recent upgrade of the software enables calculations in the 3 × 3 scanning pattern which is centered on the macular fovea under “Angiovue Retina Mode.” In SSADA-OCT, vascular density was calculated as the percentage of pixels with a flow signal greater than the threshold (2.3 standard deviations above the mean decorrelation signal for the foveal avascular zone for the controls). Notably, the algorithm was proven reliable in a previous study (Figure 1). 8–12 Moreover, the Angioretina and cross-mode examinations were conducted by one veteran doctor only. Optical coherence tomography angiography (OCTA) image from a patient with central serous chorioretinopathy (CSC). The software can automatically generate and calculate choroidal vascular density (CVD), which was shown in the table on the right. With regard to the patients with CSC, the retinal pigment epithelium layer was clear enough to be identified, and the segmentation of the choriocapillaris generated by the OCTA software was found to be reliable. Statistical data were calculated using SPSS version 22.0 (IBM, Armonk, NY). Additionally, an independent sample t test was performed to compare the CVD between the affected and normal eyes. The difference was significant when P value was less than .05. In this retrospective, observational case study, 20 patients with acute CSC were chosen (13 male, 7 female). Ages ranged from 31 years to 67 years (41.69 years ± 10.48 years), and the average duration of symptoms was less than 6 months (range: 2 days to 5 months). Serous macular detachment was observed under all affected eyes, but none was observed in any of the patients' fellow eyes. Twenty healthy volunteers (13 male, seven female) served as the control group, with an age range of 33 years to 67 years (48.95 years ± 10.16 years). The difference in age and gender between the two groups was not statistically significant (P = .536 and P = .744; P > .05). With regard to statistical data, the trial was divided into three group categories, with the median CVD for all three groups illustrated in Figure 5. All affected eyes' CVDs were collected in Group 1, with a median 0.6147 and mean of 0.6082 ± 0.0367. Group 2 represents the CVD of the normal eyes, with a median of 0.6618 and mean of 0.6585 ± 0.0165. In terms of the CVD in the healthy individuals, the median and mean were 0.6717 and 0.6689 ± 0.0128, respectively. In addition, the sample data from the computer software showed that the CVD in the affected eyes was significantly lower than in the normal eyes (P = .000, P < .05). The density of affected eyes was much smaller in comparison with that of the fellow eyes', which was statistically significant (P = .000, P < .05). Furthermore, the fellow eyes' density was also lower than in the normal eyes (P = .009, P < .05). There were 10 patients who underwent both OCTA and FFA testing, and three among them also underwent ICGA in this study. In light of the OCTA images in all affected eyes, a dark region on the choriocapillary layer was discovered. The dark region corresponds to the location of the subretinal fluid (SRF). Moreover, a few hyperreflective signals among the dark region could be easily observed through OCTA images (Figure 2). Interestingly, the hyperreflective signals on OCTA in eight patients (80%) matched the corresponding leakage points on FFA imaging. ICGA imaging results were found to be similar. The hyperreflective signals on OCTA corresponded to the hyperfluorescent area in ICGA images (three of three,100%) (Figures 3 and 4). Hyperreflective signals within a dark region on optical coherence tomography angiography of the choriocapillaris layer. Patient A – No. 2 and Patient B – No. 3 were diagnosed with acute central serous chorioretinopathy. The images of patient No. 14, a 33-year-old woman diagnosed with acute central serous chorioretinopathy. (A) Two hyperfluorescent leaking points in late phase of fluorescein angiography (FA). (B) The corresponding optical coherence tomography angiography image where the hyperreflective signals shown by the arrows match the positions of leaking points on FA. 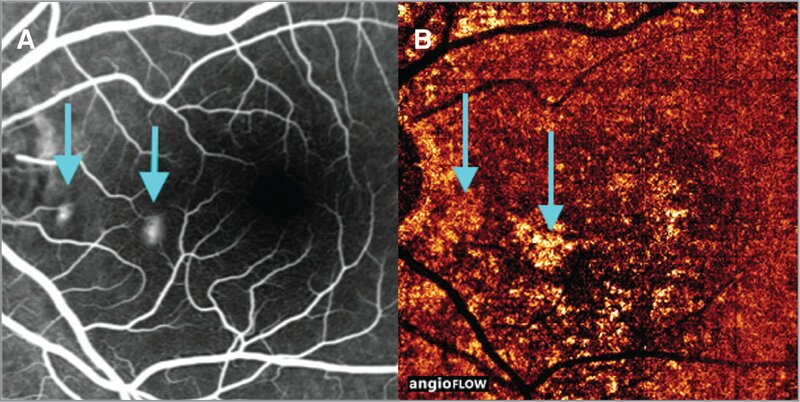 The images of fluorescein angiography (FA), indocyanine green angiography (ICGA), and optical coherence tomography angiography (OCTA), respectively of patient No. 13. (A) The hyperfluorescent leaking points in late phase of FA. (B) The same phase in ICGA. (C) The OCTA image of the choriocapillaris where significant reduction of blood flow was observed inside the circle region, and the hyperreflective signals on OCTA are corresponding to the leak points in FA and ICGA. 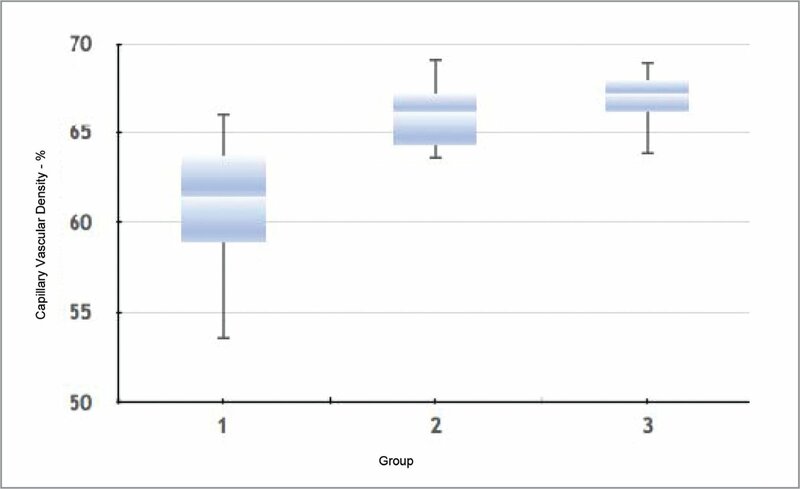 The boxplot shows the median choroidal vascular density (CVD) for all the three groups. Group 1 represents all of the patients' affected eyes' vessel density of choriocapillaris (median: 0.6147; mean: 0.6082 ± 0.0367). Group 2 is the patients' normal eyes' vessel density of the choriocapillaris (median: 0.6618; mean: 0.6585 ± 0.0165). Group 3 represents all of the normal people's eyes' vessel density of the choriocapillaris (median: 0.6717; mean: 0.6689 ± 0.0128). The hyperreflective signals among the dark regions observed on OCTA images were previously demonstrated by Costanzo et al., described as an irregular pattern of choroidal neovascularization (CNV).5 However, none of the eyes with acute CSC in this research reflected any abnormal vessels in the choriocapillaris OCTA images. The concept of OCTA is to detect changes in the blood flow of the eyes' vessels. The escalated blood perfusion in the vessels corresponded to the higher hyperreflective signals in OCTA.13 If the perfusion rate of blood was relative low, therefore, the responsive blood information could not be displayed by OCTA. Experiments in 11 eyes with CSC examined by Feucht et al. 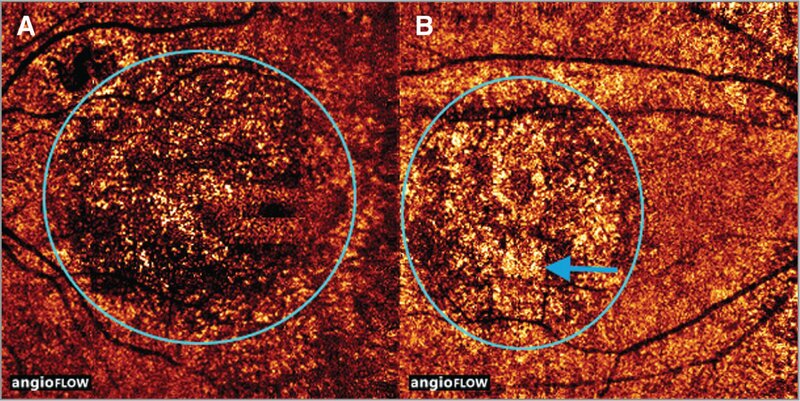 using the OCTA images of choriocapillaris did not reveal altered flow patterns directly associated with the leakage points of FFA.8 The explanation for their observation was that the leakage point in acute CSC had a very low flow rate of fluid with corpuscular particles, so the difference in fluid extension between two images at two different time points was extremely small to be visualized in images based on SSADA. However, in this study, the hyperreflective signals in OCTA actually matched the leakage points in FFA, which could imply that OCTA could possibly be an alternative method for FFA. Some of the OCTA images have hyperreflective signals but do not actually correspond to the leakage points of FFA, which we assume means that the RPE barrier had been disrupted under excessive tissue hydrostatic pressure within the choroid due to the vascular hyperpermeability. The liquid in the choroid erupted thanks to the disruption of the RPE barrier, and the split liquid could be sensed by OCTA. On the other hand, the FFAs molecules could not escape from the tiny disruptions; therefore, the area cannot be seen on FFA. The consensus has been made that the results obtained were in accordance with previous experiments conducted by Spaide et al., in that most areas of hyperpermeable regions are not associated with actual leaks.14–17 Nevertheless, the matching rate between the OCTA and FFA images were not 100%, as only eight out of 10 patients met the expected outcome. The reason could be that the leakage point of the two patients had a very low flow rate of fluid, so the OCTA could not detect the signal. However, we are still unsure of what caused this phenomenon, and further investigation is needed. Among affected eyes, CVD was remarkably lower than that seen in fellow and normal eyes. Previous studies reported that the pathogenesis of CSC was associated with the hyperpermeability of the choroid. Excessive tissue hydrostatic pressure within the choroid from the vascular hyperpermeability might lead to mechanical disruption of the retinal pigment epithelial barrier and abnormal egress of fluid beneath retina.18 In ICGA, the patients with CSC appeared to have delayed filling of segments. Nevertheless, the decrease in venous outflow in the segments might also result in this consequence. Several investigators have noted areas of slow filling, and the choroidal veins in patients with CSC also appear to be engorged.16,17 At first, the hypothesis was that the increase in the blood velocity could be induced by the dilation of choroidal vessel. On the contrary, the decreased velocity was due to overloaded pressure, and the excessive tissue hydrostatic pressure played a huge role on the dilation of the vessel. The potential cause for the flow reduction in the choriocapillaris layer could be induced by choroidal vascular hyperpermeability. However, further proof is required to verify this hypothesis. Until now, the reason for the dark regions associated with subretinal fluid (SRF) could not be fully explained. The hypothesis was the regions might, to some extent, be generated by light attenuation due to SRF. However, Costanzo et al.5 claimed “the dark areas corresponding to a flow void are due to a focal atrophy of choriocapillaris, next to the compression produced by the enlarged vessels from outer choroids.” In this study, the CVD of fellow eyes was lower than that seen in normal eyes, and there were neither dark spots nor SRF in patients' fellow eyes. Regardless, the light attenuation or artifacts could be present, but they had no influence on the final results. To conclude, this report aimed to demonstrate and compare the OCTA images of eyes with acute CSC with other imaging results. OCTA appeared to be a promising method since it is noninvasive and can provide quantitative analysis. In the imaging results, hyperreflective signals within the dark regions of OCTA images were observed. In addition, the CVD of eyes with acute CSC was significantly lower than in normal eyes. Nevertheless, further studies should be conducted to confirm the preliminary results to thoroughly assess the feasibility of this new diagnosis technique. Central Serous Chorioretinopathy.American Academy of Ophthalmology EyeWiki. http://eyewiki.aao.org/Central_Serous_Chorioretinopathy#Diagnostic_procedures. Updated April 18, 2017. From the Department of Ophthalmology, Peking Union Medical College Hospital, Peking Union Medical College, Chinese Academy of Medical Sciences, Beijing, China. Address correspondence to Fangtian Dong, MD, Department of Ophthalmology, Peking Union Medical College Hospital, Peking Union Medical College, Chinese Academy of Medical Sciences, 9 Dongdan 3rd Alley, DongDan, Dongcheng Qu, Beijing Shi, China, 100006; email: d_fangtian@sina.com.